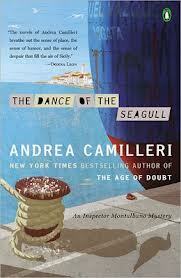 Another favorite crime fiction writer of mine has a new novel out in translation, taking us to Sicily with The Dance of the Seagull, #15 in Andrea Camilleri's excellent series of novels featuring Inspector Salvo Montalbano. I haven't missed one of these books, reading them faithfully since book #1, The Shape of Water. While they are definitely crime novels, they're also filled with the sights, sounds, smells and tastes of Sicily, and Inspector Salvo Montalbano happens to be one of my favorite characters in the crime fiction universe. Definitely recommended, but best to read from the beginning.